Never mind the mast, depressing as it is. How is the eye coming along? That was just one light pole decorated with flags, there are other areas like those I passed this morning where every pole has a least one flag if not two or three, all fluttering at half mast. Doesn’t matter where you live Gm politics and world events (past and present) are enough to either fill us full of despair or send us into a flat spin – the marching season will begin soon so there’ll be plenty to keep ‘some of them up there’ busy and on their toes. Hello there, are you well Gm? Cathy, I am fine, making the most of the fine days or dabbling in needlework projects. Count your blessings. They’re banning flags over here. Al, there is no respect for flags over here despite all the fuss about them. New Flags appear at the end of June in time for the Somme Commeration and they are left hanging throughout the Marching season which goes on until September. Even then the flags remain until they fall apart about a year later! With that kind of weather, I am not surprised that even the flags are flying half mast. 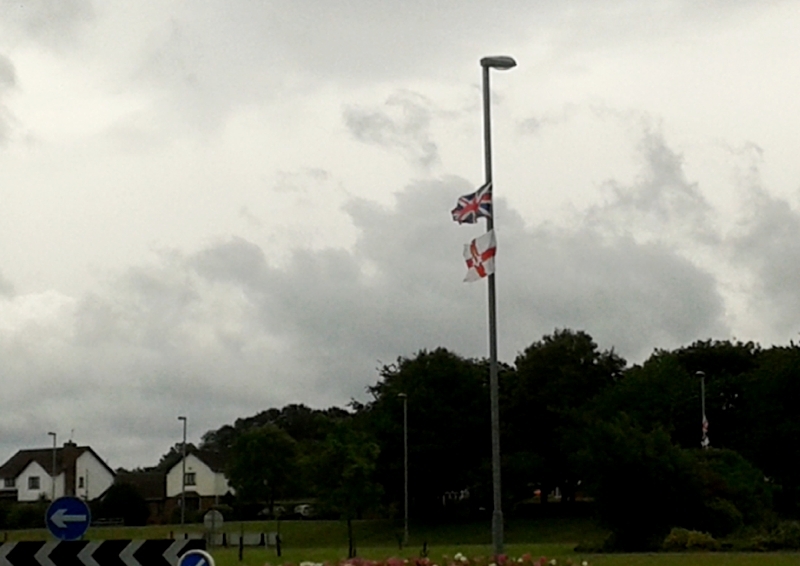 Incidentally, over here we use half mast to ridicule some of our politicians. Ramana, over here the politicians ridicule themselves! Cloudy, grey and wet here, too, with all the vegetation lush and green. Normally, we’re having to water plants by this time of the year! That photo was taken on Monday and when I got to Belfast, I had to buy an umbrella! Nah! It is way more complicated than that! Of course – is it because it is marching season? Things seem to be calmer this year … so far! Early days yet. Hopes that people stay reasonable. Har. The atmosphere at the Tall Ships may still be around! I heard about that, Cathy. In Ireland both North and South, some ‘political groups’ have adopted their national flag as their own and used it to taunt others. We need new National Flags that can be used with pride to bring communities together and help us move forward and leave the nastiness of the past number of years to rest. Thanks for the shots of the tall ships and all, I’ve come back to see them more than once, just because I like ’em. Welcome back Frank, my blogging activity has been in the slow lane of late.